Sherlock Holmes is facing his worst enemy: declining crowds at theaters as this year's domestic movie attendance dips to the lowest in 16 years. 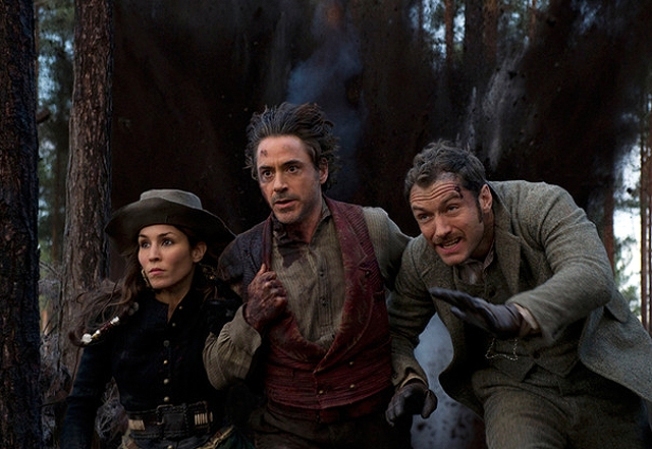 Robert Downey Jr.'s sequel "Sherlock Holmes: A Game of Shadows" debuted on top with a $40 million weekend, off 36 percent from the first installment's $62.3 million opening two years ago, according to studio estimates Sunday. The first movie opened over Christmas weekend, one of the busiest times for movie theaters. Distributor Warner Bros. predicts the "Holmes" sequel, which pits Downey's detective against archrival Professor Moriarty, will make up the lost ground over the holidays. "The pattern is different," said Dan Fellman, the studio's head of distribution. "What you can put in the bank those nine days before the official Christmas play time, that's the difference between our opening with a bigger number on Christmas day and opening early this time. At the end of the holiday period, we should be in the same place." The "Holmes" sequel opened in six overseas markets, including the detective's native Britain, and took in $14.7 million to bring its worldwide total to $54.7 million. After two previous weekends that were Hollywood's worst of the year, overall business was down again, about 12 percent lower than the same weekend in 2010 as Hollywood struggles to interest audiences in its big year-end releases. Paul Dergarabedian, an analyst for box-office tracker Hollywood.com, estimated that the number of tickets sold domestically in 2011 will come in below 1.3 billion. Robert Downey Jr and Jude Law return as the dynamic duo of Sherlock Holmes and Dr. Watson, as they face off against their greatest foe, Dr. Moriarty. Noomi Rapace, Stephen Fry, Jared Harris and Rachel McAdams co-star, opens Dec. 16. That would be the lowest attendance since 1995, when admissions totaled 1.26 billion. Domestic attendance in modern times peaked at 1.6 billion in 2002 and has been on a generally decline since. "These low-attendance numbers are taking the gas out of the tank," Dergarabedian said. "All the momentum we had kind of came to a dead stop." The 20th Century Fox family sequel "Alvin and the Chipmunks: Chipwrecked" did even worse than "Holmes." "Chipwrecked" opened at No. 2 with $23.5 million, about half the business the first two "Chipmunks" movies did on their debut weekends. The studio had expected a bigger debut, but with schools shutting down for the holidays, Fox executives hope business will pick up. "We are battling a marketplace issue right now," said Chris Aronson, head of distribution for 20th Century Fox. "We cannot make light of that. However, we have a very satisfying, playable movie and the only G-rated movie for Christmas. So as kids get out this week, this is going to help position it for a successful run." "Chipwrecked" added $14.5 million in 38 overseas markets, bringing its worldwide total to $38 million. Tom Cruise and Paramount had a spot of good news. Their action sequel "Mission: Impossible - Ghost Protocol" got off to a healthy start at No. 3 with a $13 million weekend playing exclusively at huge-screen IMAX theaters and some other large-format cinemas. "Ghost Protocol" goes into general release Wednesday. The movie already has opened in 36 overseas markets, where it pulled in $68.2 million, putting its global haul at more than $80 million. With critics praising the movie's spectacular action sequences, "Ghost Protocol" may restore the hitmaker status of Cruise, whose audience became disenchanted with odd antics in the star's personal life five or six years ago. "I would think any of that is way in the past," said Don Harris, head of distribution at Paramount, which took the unusual step of going early in huge-screen cinemas to build buzz for the general release. "The plan was always to put the movie out into the best presentation theaters in North America," Harris said. "We hoped that people would recognize how good the movie was and how special it was being treated." Paramount's comic drama "Young Adult," starring Charlize Theron, had a weak expansion into wider release, finishing at No. 7 with $3.7 million. The film had opened with big numbers a week earlier in a handful of theaters. At the beginning of 2011, Hollywood's summer and fall lineup looked so strong that studio executives were predicting the industry would break the domestic box-office record of $10.6 billion set in 2009, a mark that was nearly reached again in 2010. But with less than two weeks left and revenues lagging 4 percent behind last year's, that record is out of reach. The picture is even bleaker factoring in this year's higher ticket prices, which mean attendance is running 5 percent below last year's. Hollywood still can go out with a bang. Along with the new "Mission: Impossible," the holidays bring two more big thrillers - Steven Spielberg's "The Adventures of Tintin" and David Fincher's "The Girl with the Dragon Tattoo" - along with Spielberg's historical epic "War Horse" and Cameron Crowe and Matt Damon's family-friendly comic drama "We Bought a Zoo." 1. "Sherlock Holmes: A Game of Shadows," $40 million ($14.7 million international). 2. "Alvin and the Chipmunks: Chipwrecked," $23.5 million ($14.5 million international). 3. "Mission: Impossible - Ghost Protocol," $13 million ($68.2 million international). 4. "New Year's Eve," $7.4 million. 5. "The Sitter," $4.4 million. 6. "The Twilight Saga: Breaking Dawn - Part 1," $4.3 million. 7. "Young Adult," $3.7 million. 9. "Arthur Christmas," $3.6 million ($9.7 million international). 10. "The Muppets," $3.5 million ($600,000 international). 1. "Mission: Impossible - Ghost Protocol," $68.2 million. 2. "Puss in Boots," $30.4 million. 3. "Sherlock Holmes: A Game Of Shadows," $14.7 million. 4. "Alvin and the Chipmunks: Chipwrecked," $14.5 million. 5. "Arthur Christmas," $9.7 million. 6. "New Year's Eve," $8.9 million. 7. "The Twilight Saga: Breaking Dawn - Part 1," $8.1 million. 8. "Happy Feet Two," $4.4 million. 9. "In Time," $3.3 million.